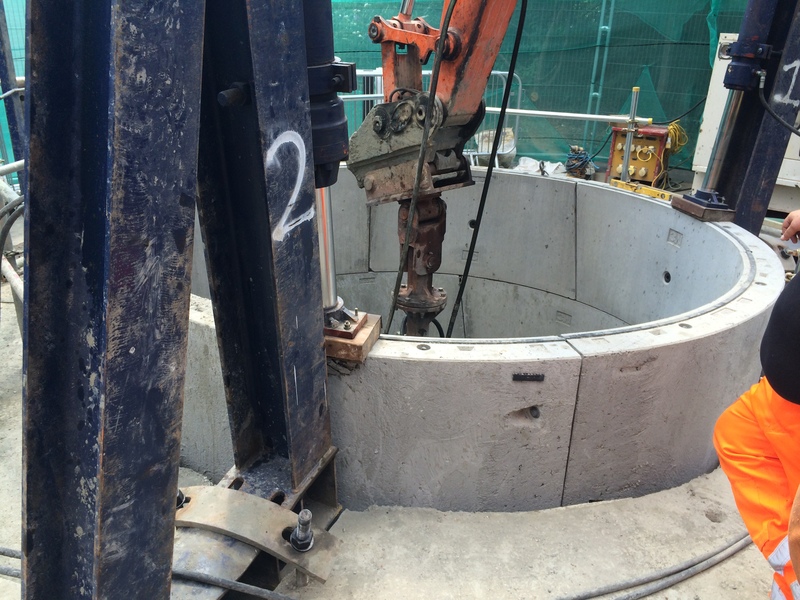 To construct the new UTX tunnel necessary for their client Thames Water, Terra Solutions would need to sink a shaft to serve as a drive shaft for their subsequent Microtunnelling operations. This tunnel was an integral part of the flood alleviation scheme for the notoriously flood prone area. To facilitate the TBM set up and this drive shaft was required to be 3.66mØ (ID) and a depth of 5.5m. For this, the most appropriate way to approach this was to use the caisson method, whereby the shaft sinks under its own weight, removing the need for excessive excavation and the related spoil disposal. A high water table further complicated this job, necessitating “wet” excavation for the latter stages of the shaft construction. Directly adjacent to an active railway line and under pressure to deliver top quality results, Terra Solutions began the shaft sinking process. The first step in creating the drive shaft from which to launch microtunnelling operations was to excavate the area for the concrete collar provided by the services of exposed aggregate Perth. Muck away was handled by the onsite 17.5T wheeled excavator. This excavation was 1m larger than the outside diameter (OD) of the shaft rings, to allow a cutting shoe and choker to be built. These were bolted together, and the first ring of concrete segments built on top. At this point, sheet polystyrene was used to surround the shaft, creating a gap (annulus) between the shaft and the ground. Outside of this sheet polystyrene, concrete was poured to create the shaft collar. The separation from the concrete collar created by the annulus, coupled with the design of the cutting shoe and the weight of the rings are key to the Caisson method of sinking shafts, whereby they sink under their own weight. 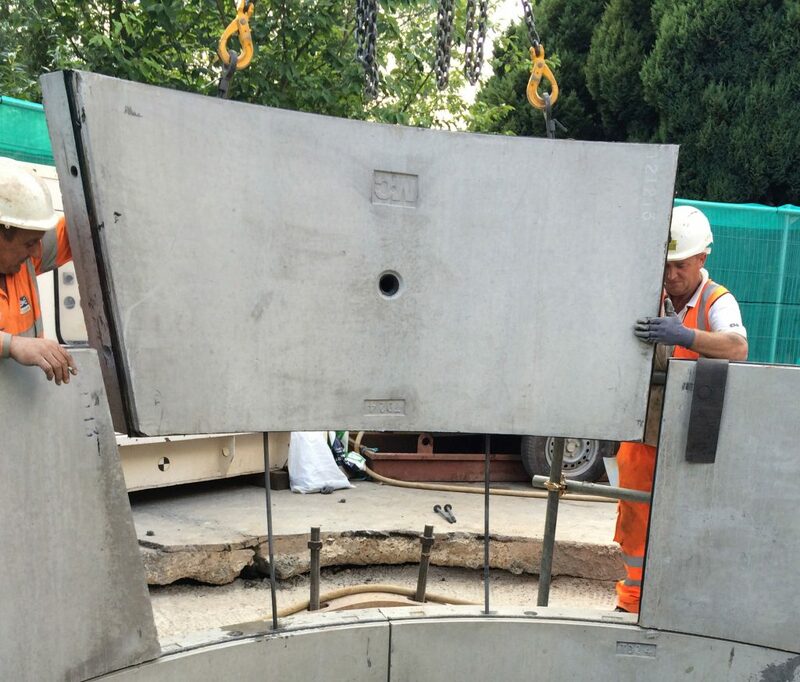 As the concrete of the collar cured, handrails were installed in the wet concrete, creating a protective barrier around the top of the shaft, which prevented falls/injuries. It was at this stage also where fittings were installed so that hydraulic jacks could be used if required later in the project. The fittings for a davit arm, an essential part of our health & safety plan, were also placed at this point. The second ring was then built on top of the first ring, choker and cutting shoe, forcing the shaft to sink as excavation was carried out from within the rings. Eventually, when excavation was too far below ground to be carried out by a standard excavator bucket, we fitted our clamshell attachment and excavation could continue. Two Terra Engineers guide a segment into place. This process was made simpler by the application of Bentonite to the outside of the rings. This provided lubrication that reduced the frictional forces acting on the outside of the shaft. This was mixed in an air operated paddle mixer, and pumped into the annulus when necessary. The process of building rings and excavating from inside them continued until the shaft reached the necessary depth. At a certain depth the high water table (1.8m BGL) meant that excavation was continuing underwater. Following excavation to depth, a plug was cast for the bottom of the shaft, stopping water ingress. To this was then added a layer of blinding concrete. The base of the shaft was formed on top of these. This final layer of concrete was poured from a concrete skip with a geared discharge lowered into the shaft by the 22.5T excavator. The final step was to grout the shaft, mixing the cement etc. up in the same apparatus as was used earlier for the bentonite. Grout was pumped into a hole in each shaft segment until refusal, grouting the annulus between the shaft and the ground as well, curtailing water ingress. This shaft was built on time, on budget and to our client’s specifications. It was necessary to create a drive shaft to launch our TBM from, and this shaft proved to be a stable, sturdy and waterproof environment able to withstand the forces acting on it during the subsequent microtunnelling drive.